Scrapped in 1930 at Baltimore. Dictionary of American Naval Fighting Ships: Polar Bear (ID-3666) was built in 1918 by the Baltimore Dry Dock and Shipbuilding Co., Baltimore, Md., requisitioned by USSB for use in NOTS as a refrigerated cargo ship 28 September 1918; and commissioned at Baltimore 3 December 1918, Lt. Comdr. Richard Russell Lukens, USNRF, in command. Assigned to NOTS, Polar Bear sailed 19 December 1918 with a full cargo of general Army supplies for the American Expeditionary Force in France. She discharged her cargo at La Pallice, Verdun, Bordeaux and Pallice before returning to the U.S. 3 February 1919. 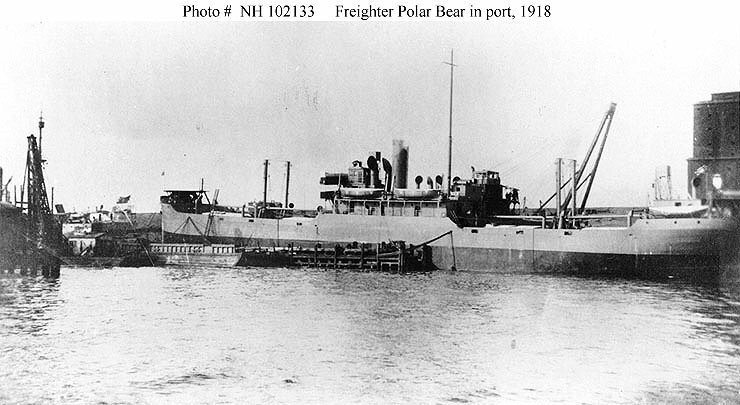 Polar Bear was decommissioned at New York 10 March 1919, and was returned to the USSB.